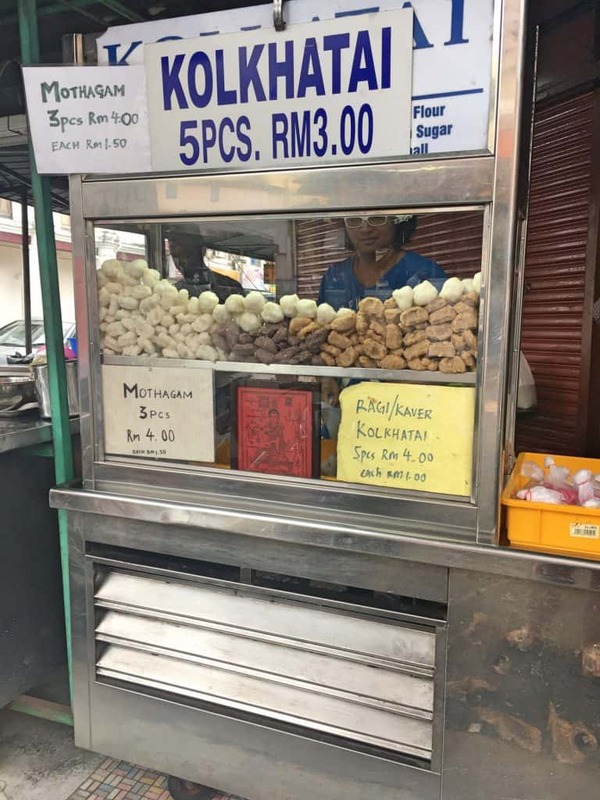 You know how much I love food tours so it was great to get this guest post from Kylie who took this food tour in Malaysia! If you’re headed this way and love food like us, then you will for sure want to read this article! 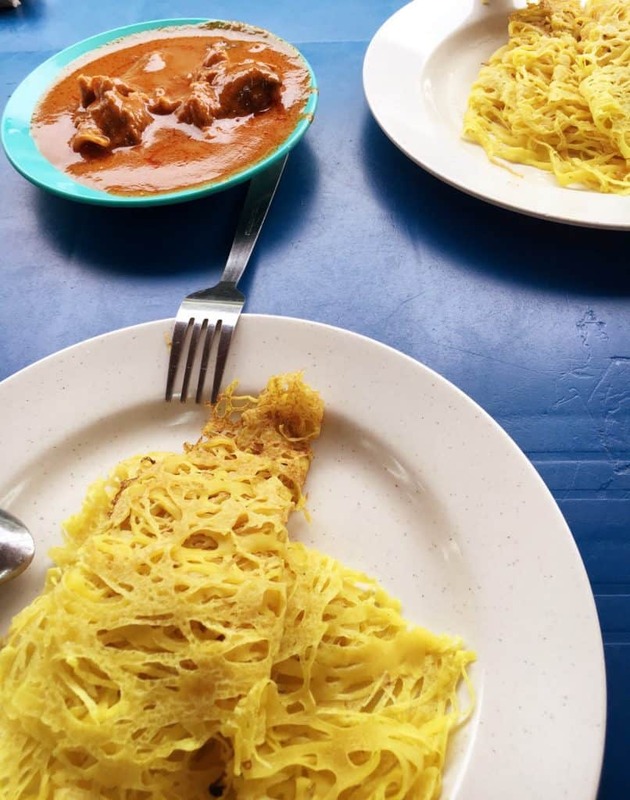 Penang is one of the great cultural melting pots of the world, and is renowned for its incredible street food. 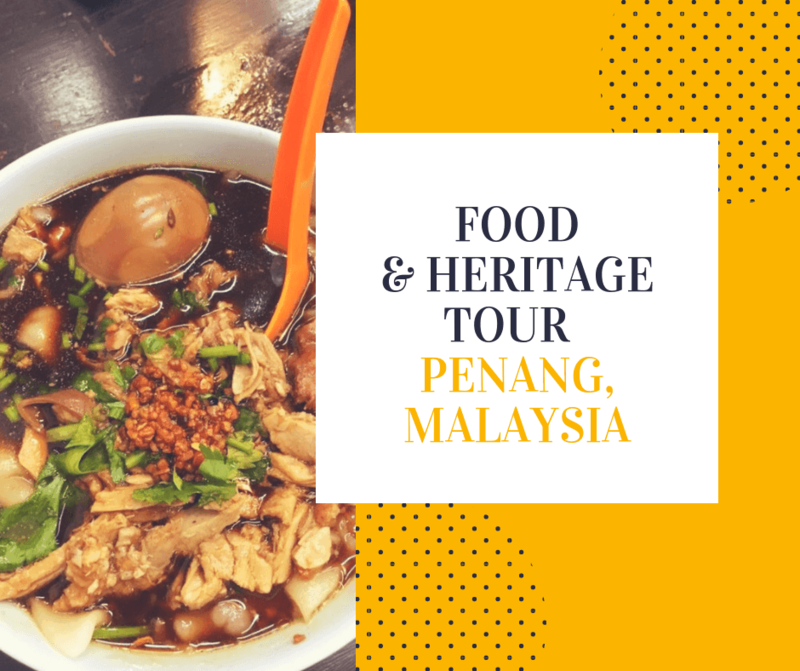 While we were visiting we also wanted to find out more about the history and heritage of Penang, so decided to combine the two by taking a dinner tour with Heritage on a Plate. 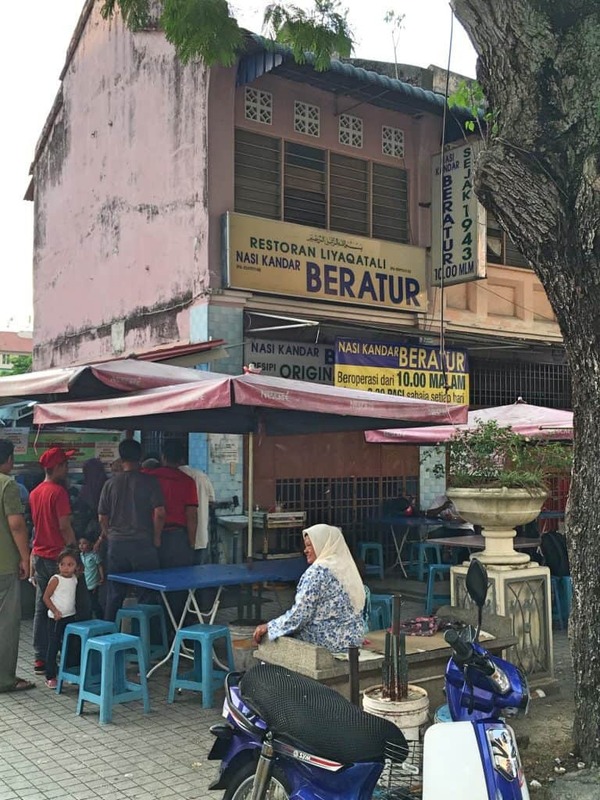 The Heritage on a Plate tour is a 3-hour food hop, where you get to experience a mix of Indian, Chinese and Malay street food, as well as learning about the fascinating history and background of the UNESCO heritage city of Georgetown in Penang. We met our guide Dhanen in the heart of Little India in Georgetown, where he ran through the format of the tour. He wisely told us to pace ourselves, given that there was three hours of eating ahead of us! First stop was a little street side cart which specialised in Southern Indian sweets called Kolkhatai. Dhanen explained that due to commercialisation and a growing preference for mass produced Northern Indian style sweets, these were in danger of becoming a dying art. We tried the ragi kolkhatai which was the darker sweet made from jaggery (a type of sweet honey), coconut and ragi powder, and the mothagam made with dhal and coconut. They were both delicious! Next stop was over to another streetside stall in Little India. Here we tried roti jala which was a mutton (goat) curry, served with roti bread. The roti is cooked to look like the famous jalebi sweets. It was absolutely divine, very rich and tasty but without being overly spicy. We also tried some egg samosas here and the famous Malaysian kopi which is coffee made with sweetened condensed milk. 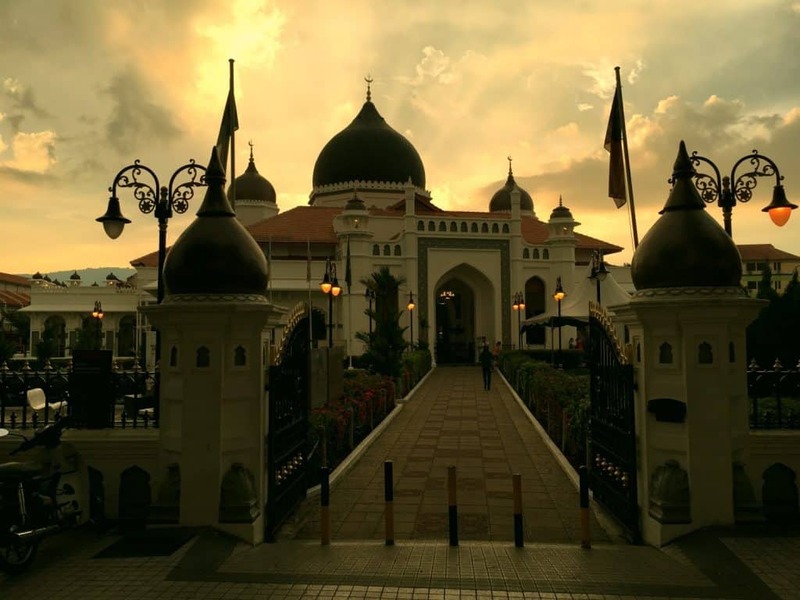 We stopped to admire the stunning Masjid Kapitan Keling and Dhanen pointed out a very ordinary looking shop next door called Nasi Kandar Beratur which loosely translated pretty much means ‘queue up’. This restaurant only opens at 10pm and was traditionally THE place to eat for port workers who were finishing their shifts and looking for a place to eat. The port hasn’t existed for many years, but the restaurant is still going strong and often has queues down the street well before 10pm! As we wandered over to the Chinese heart of Georgetown, we passed by some of the beautiful heritage mosques, temples and colonial style buildings. 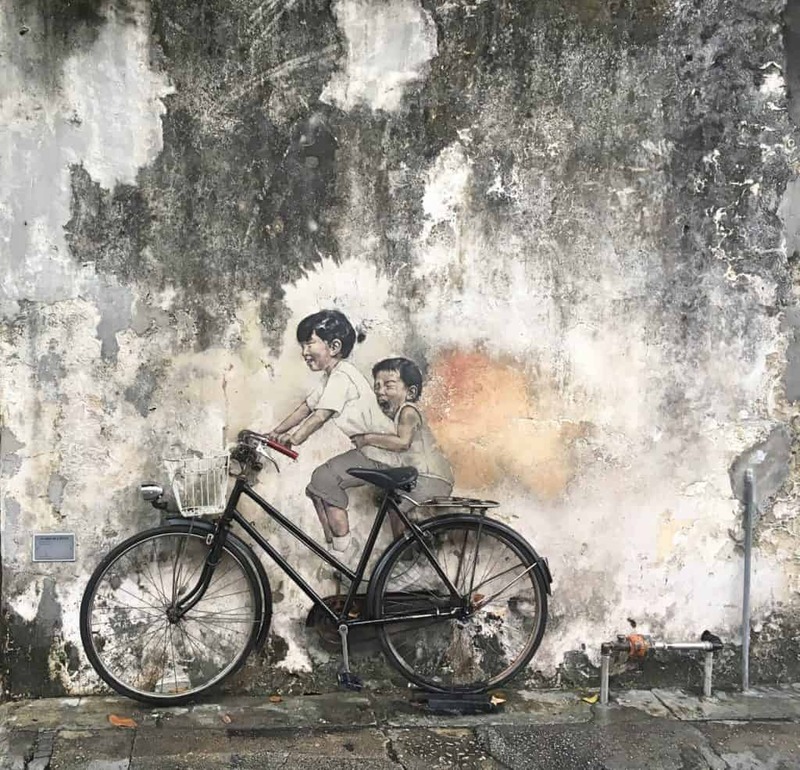 Dhanen gave us insights into the history of these buildings and helped us to understand the fabulous history of Penang, including its more recent history as a street art mecca. It was also a great way to make some space for some more delicious food! 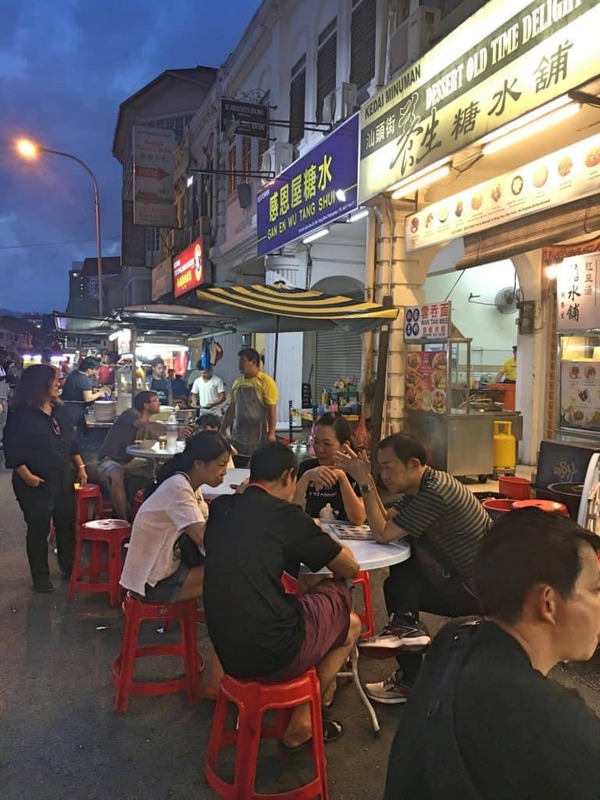 Once we hit Kimberly Street, it was time to try some Chinese and Hokkien style delicacies. 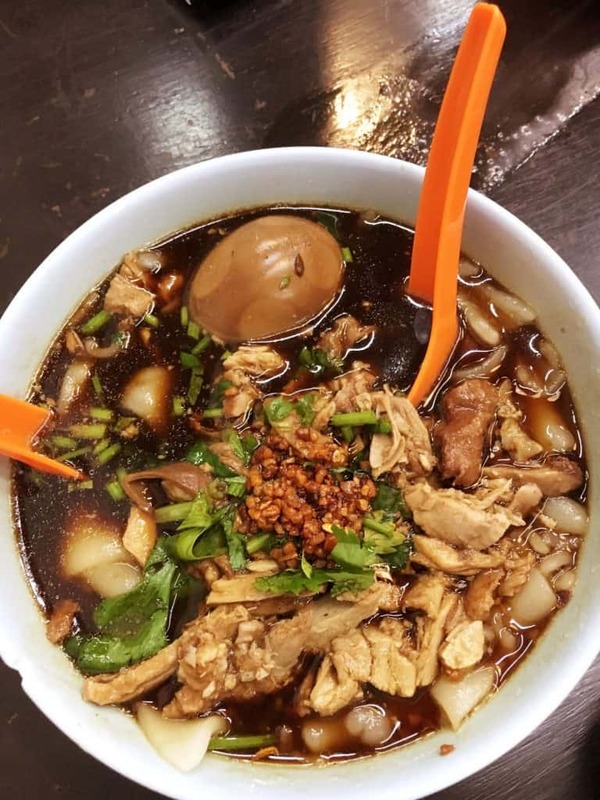 First up was Duck Kway Chap which was a beautiful rich broth filled with noodles, duck, herbs and a duck egg. It was absolutely stunning. Traditionally the soup is made with all of the duck innards and offal, however we opted just for the duck meat version! We also tried a selection of Chinese sausage called Lorbak which is typically eaten as a snack food. It’s served with a dipping sauce of tapioca, egg white and soy sauce. 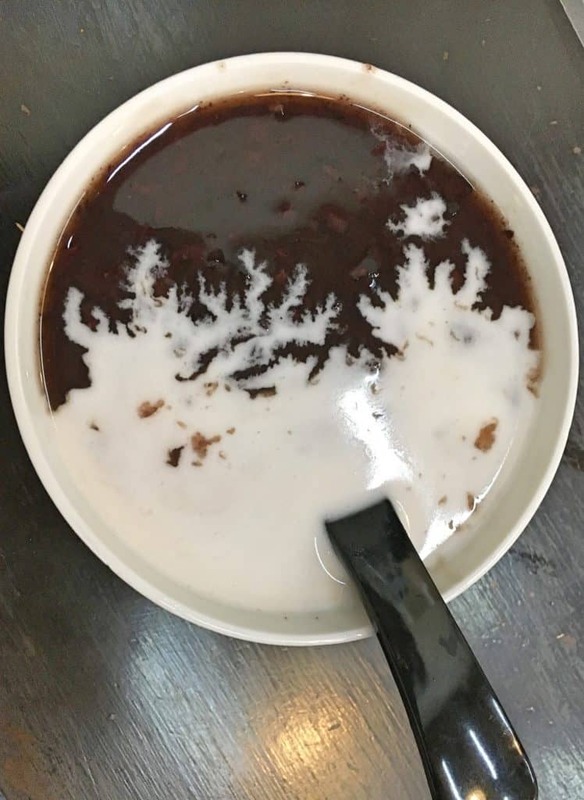 Our last dish in Kimberly Street was a dessert called Bee Koh Moy, which is a black sticky rice served with coconut milk and salt. Starting to feel very full, we wandered further up towards the UNESCO World Heritage Site Buffer Zone, where Dhanen took us to his favourite bamboo noodle joint Hong Kee Wan Thun Mee. These noodles are made by combining the eggs and flour, then are pressed with giant bamboo poles. Apparently they are quite new on the scene, but the noodles were absolutely delicious, almost crunchy like, and served with a warm broth. It was great to sit outside the shop and watch the staff prepare the noodles. 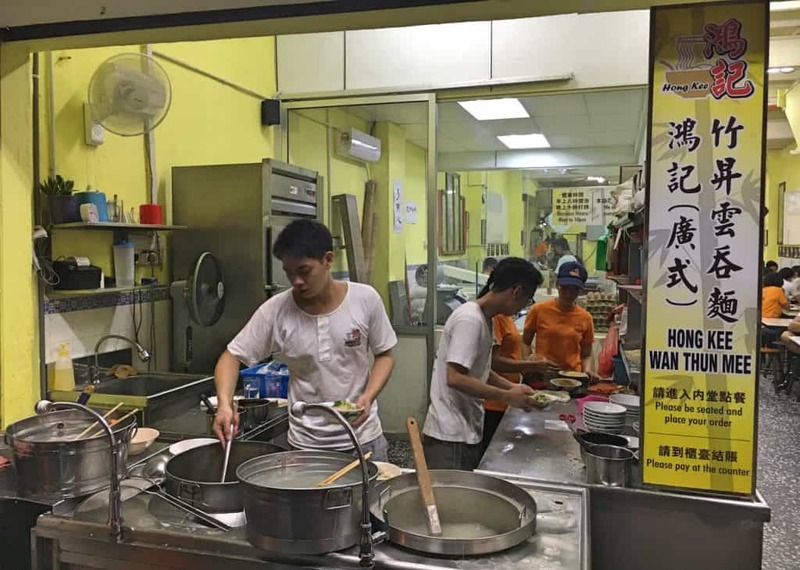 If you visit during day time, you can see them making the noodles with the giant bamboo poles. To wash all this food down we ordered a Pa Poh drink made from Chinese herbs which tasted slightly of aniseed and was very refreshing. By this time we were almost full to the brim, but Dhanen said there was one last stop and took us back to Little India where we began. We visited one of his favourite shops where he ordered us a roti bomb. Not quite sure what to expect, we were delighted when out came a delicious flaky roti that was stuffed with sweet sugar on the inside. It was a divine treat that we washed down with a smooth mango lassi. After almost four hours we said our goodbyes and headed for a taxi. 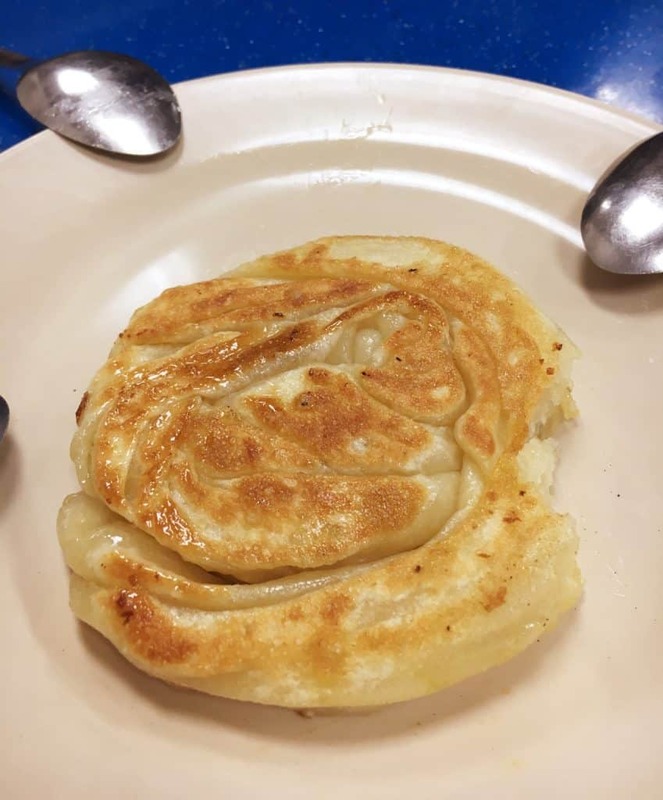 We really enjoyed our tour with Heritage on a Plate, and Dhanen was a very knowledgeable guide about both the food and Penang’s heritage which is one of his passions. He also pointed out lots of food stalls that were only open during the day so we could make a note of them to come back and try the food. 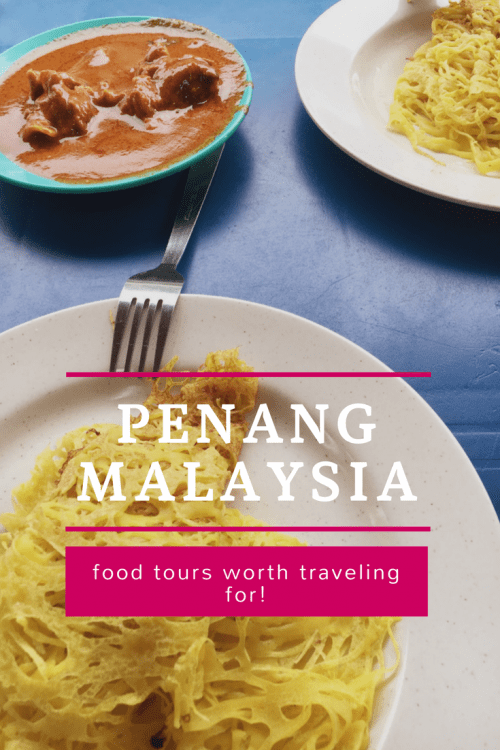 We really loved doing the tour as it gave us the confidence to explore more Penang street food during our stay, and we returned to a few of the places we’d visited on the tour to try the dishes again with a less full stomach! 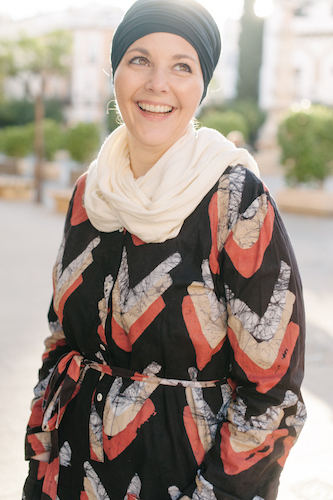 Kylie Gibbon is a passionate traveller and foodie who’s been to over 45 countries around the globe. The Our Overseas Adventures blog chronicles her family travels with her husband and 5 and 7 year olds in tow. Last year the Gibbon family quit their jobs, packed up their lives and took an 8 month sabbatical through SE Asia, Europe and the Middle East. Now based back in New Zealand, the family is continuing to travel as much as possible and are always planning their next adventures! Hi, nice article. But may i know if the duck soup was halal? This was a guest post from someone else who was sharing their experience so I’m not sure if it was halal or not!